Understanding the elements that go into being a successful recruit will set you on the right path early and keep you ahead of the game. It’s important for recruits not to lose focus of the end goal and to concentrate on understanding the core recruiting items, which will make the recruiting process, proceed smoothly once these main items are understood. Academics are just as important as athletic skill when it comes to meeting college eligibility requirements. The NCAA division I and division II academic standards are the strictest out of the college athletic division levels. Some colleges and universities will need athletes to meet their own standards which may be higher than those set by the NCAA or NAIA eligibility center. Potential recruits who want to reach the level of college athletics, don’t always consider initial academic eligibility requirements until it’s almost too late. Becoming eligible to meet NCAA or NAIA academic standards is an area in the recruiting process which needs to be understood early. 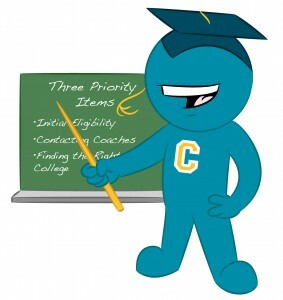 Athletes should be meeting with high school counselors in order to determine which courses they will need to take throughout high school, what GPA they will need to maintain and which college entrance exams they need to have taken. Rule of thumb for student- athletes: Keep your grades up throughout high school to make sure you will not be left in the cold when it comes time to meet academic requirements. Reaching out to coaches can be one of the hardest things recruits will need to do in order to get recruited. Some athletes may struggle with this because they do not want to bug coaches. Other athletes may be under the impression that college coaches will find them, and do nothing to increase their chances of gaining exposure. Contacting coaches is one of the easiest things to do during your recruiting process. To get started you will need to take some time to create an introductory email, a sports resume and video link. Sending coaches a video link will allow them to see who you are and why you are interested in their program. The biggest item that recruits need to understand is that coaches will only know athletes who have taken the time to reach out to them. Recruits, usually have an idea of where they want to go to college. From here athletes will need to evaluate themselves as a player in order to find the best college fit for them. College division levels can be used as a guide to help incoming student-athletes determine which level of play they will be best suited for. Next, athletes will be able to narrow down their search to colleges in the preferred division level. This is just the beginning of learning and understanding the recruiting process. Potential recruits will need to continue to work hard throughout their process in order to understand the many elements of college recruiting. If you have more questions about navigating through the recruiting process than leave a comment below or connect with us on Facebook or Twitter.